VATICAN–The focus of the conversation when President Barack Obama met with Pope Francis on Thursday was expected to be the gap between the rich and the poor. Obama has called income inequality “the defining challenge of our time,” and said as much to Pope Francis before the Holy Father, mesmerized with a black teleprompter Obama was using to discuss the plight of the poor, politely asked the President to stop what he was saying and to explain what “that black thingy” was behind him. 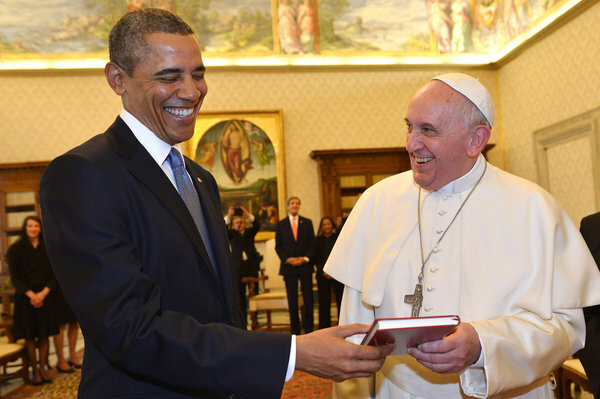 “Then boy are you in for a treat,” Obama reportedly told Francis. “Behold the all-new Autocue. Autocue is the world’s leading teleprompting solutions provider, with an unmatched heritage and the largest installed base. Autocue introduced the first teleprompters in 1955 and have led innovation in the industry ever since. Quite simply, Autocue is the household name in teleprompting. Just write out what you want to say, have someone take a look at it to make sure it can’t be misrepresented, and then just read off of it. No more off-the-cuff comments that’ll lead to scrutiny by some orthodox Catholics. Simply read off the teleprompter, bless everyone, and walk away.